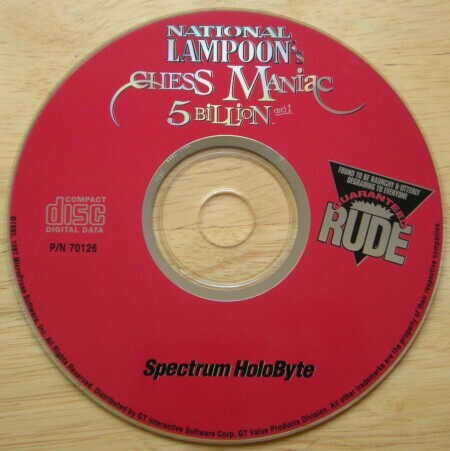 Chess Maniac Five Billion and One is a spoof of Chessmaster and goes quite a bit further to entertain than Battle Chess does. The emphasis here is on the word maniac because the people who designed this game had to be slightly off. The thing that impressed me about Chess Maniac is that even though the game does not appear, at first glance, to take chess very seriously there are a decent number of difficulty levels (10) and a lot of gameplay options that the player can experiment with that will not only provide a different look and feel but will also satisfy the chess enthusiast from novice to expert. I expected silly. I didn’t expect this kind of challenging and satisfying chess experience. Well done, MicroProse/Spectrum Holobyte. The Maniac (the games host as described in the manual) is actually rarely seen in the game but the things he does to affect your play are present everywhere. If he beats you he will have raised your ire enough to want to play him again and kick his puny you-know-what. If you beat him, you will want to grind your victory in his face after the verbal abuse you have taken. After which he will calmly exclaim “Up Yours”. If you have ever seen 2001: Space Odyssey and remember the voice of HAL at the movies end you will recognize the voice in this game immediately. A computer’s version of insanity, I guess. There is also an option to turn his play by play description off although you can’t shut him up completely without turning the sound off. If you are ever feeling like playing a vanilla game of computer chess simply select the 2D board and turn your speakers off. If you want to play another person you can do that as well but you will have to do it on one computer; no networking is included. 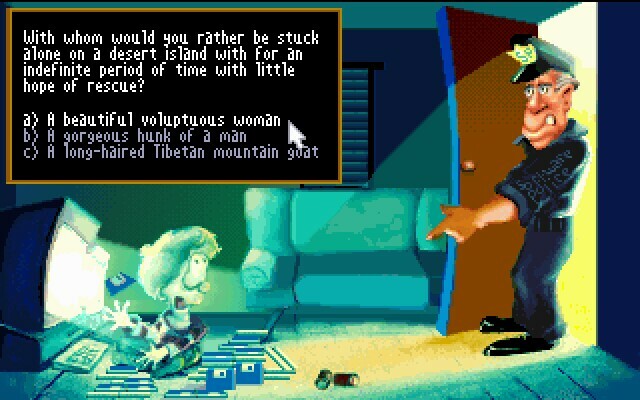 After the opening credits, splash screens and copy protection you are presented with a choice of going with the boring sets or the bawdy sets. If you don’t have the 3D board display option turned on, the bawdy and boring game is basically the same. With 3D turned on they are quite different. You can choose whichever set fits your mood at the time. In all variations of the sets you can use, the opponent will try to distract you in every way possible. He will throw insults at you. He will mock your bad moves and get riled at your good ones. He will do anything he can to break your concentration. And, if you aren’t paying attention, he will cheat. So don’t get up and go to the bathroom and leave him sitting at the table by himself. He can’t be trusted. The cheating scenarios are also a little silly and should be experienced before you turn the cheat option off. If you catch him cheating you can press any key on the keyboard to stop him and possibly dole out a little punishment. He won’t be able to cheat without you knowing unless you have left the computer. Bawdy. 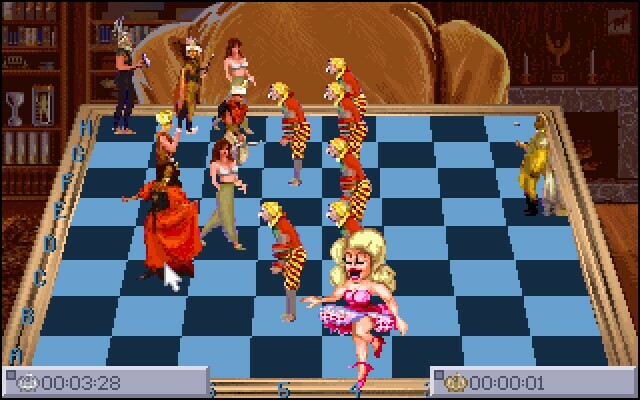 To truly appreciate just how weird Chess Maniac can be you have to play the bawdy set a few times at least. This is the set that will provide the animations that fans of Battle Chess will probably enjoy. Unlike Battle Chess the animations in this game are really video clips involving human beings doing strange things. I have played at least a dozen games on the bawdy set and there are still new and unexpected things that happen during the course of a game. The animations/clips aren’t as well done as in the enhanced Battle Chess but they are decent and are enough to make you smile at the silliness and want to test all combination of captures as each will provide it’s own unique twist to the game. To be honest, though, after you have played a few games on the 3D bawdy set you will probably switch over to 2D or go to the “boring” 3D set as the uniqueness of the video clips will have, at least temporarily, worn off and you’ll want to see the board better. My chief complaint of this board setting is that the characters obscure your vision of the board and it is sometimes difficult to determine which square a character is standing on. If you have difficulty recognizing what piece a character represents the player can right-click that character and the corresponding piece will be announced. Boring. Boring? Not exactly. The 3d version of the boring set doesn’t have the video clips that play when a piece is captured. The chess pieces are represented in their traditional form and an occasional yawning pawn is about all you are going to see for on-board animations. What the game will provide in this set is a changing background and music that is meant to distract. The music can be turned off. The backgrounds aren’t really that distracting but might be enough to break your concentration. As in the bawdy set, the opponent’s voice is there to insult you and heckle you throughout the game. In conclusion I guess I have to say again that for a game that I didn’t expect to be more than an off-color version of Battle Chess, I was impressed at the number of variations that can be created with the controls that the player is given. It may not rival Chessmaster but was impressive nonetheless.